The Kedah Paddy Museum is the first Museums of its kind in Malaysia and the fourth one in the world to have been opened after Japan, Philippines, and Germany. The architecture of the Museum is rather unique and represents the bushels of rice stalks that have been harvested. The Kedah Paddy Museum showcases the entire process of cultivation of paddy in Malaysia and also exhibits all the equipment and the tools that have been brought to use in this business over the years. Paddy cultivation’s history in Malaysia is portrayed through the exceptional murals created by 60 artists. The Museum has been dedicated to the simple and hardworking farmers while also honouring the culture, significance, and history of paddy farming. 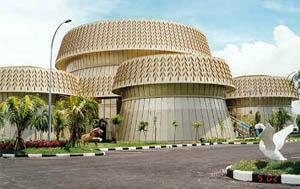 How popular is Kedah Paddy Museum? People normally club together Malaysia Kedah and Sultan Abdul Halim Airport while planning their visit to Kedah Paddy Museum. Impressive building like shoves of rice=paddy. Inside a mighty diorama of the surroundings, with all phases of rice production. And more info about all aspects of paddy. 5rm entry for adult. Two floors of display on a circular layout. Dated. Not very well lit but nonetheless worth a one hour of visit. Toilet entry is 30sen. If u don’t have ur own transport good luck cos getting a grab to this place from city is easy but the return trip will be very hard cos there is no grab or taxi available in this kampong area. U will be literally trapped there and the counter staff barely know any English at all to help u. So go at yr own risk. Ask me to back again ? Nope never. The Drive to the museum is already worth it as it is next to a large lime stone formation which can also be visited. When you go inside you might think at first it's a nice museum with artifacts related to rice cultivation and harvesting. You can also see rice varieties from around the world and then are some interesting stories and myths about Kedah. However be ready to be amazed when you go upstairs. It's the Kedah version of Panorama Mesdag. You can spend quite some time there and be amazed at the work. A good 20 minutes drive into a padi farming village from the nearby Paddy museum lies a breathe taking view of the farming community of Alor Setar. Our unplanned journey into this uncatered territory was more by accident then by chance since we are unfamiliar with the surrounding and routes around this part of the district. Then again I have no qualms neither any complaints since I stumbled upon one of the most stunning and a breath taking display of a splendorous Sunset on show. It's was indeed a memorable candid view to watch the entire routine uninterrupted. Couple with a breezy weather and cooling air bracing across your face was indeed energizing. The area was huge and not many houses though, we came a cross a traditional wooden house, it looks old but still usable. The area was rather quiet and not much activities going on throughout the journey but it has not dampen my spirit, I took some pretty nice pictures for my collection. If you one of those frick that enjoys watching sunset here a place you must visit. All I can say is, its mesmerizing.